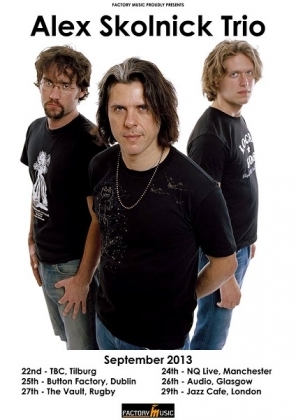 Alex Skolnick Trio announce UK and European dates! When he's not touring the world as guitarist for thrash metal legends testament, Alex Skolnick can be found leading his very own jazz outfit, The Alex Skolnick Trio. As well as featuring the dextrous guitar skills of Skolnick, the band also includes Matt Zebroski on drums, and Nathan Peck on bass. The Trio is well known for its inventive jazz take on hard rock and heavy metal 'standards' (their repertoire includes metal cornerstones such as Iron Maiden's 'The Trooper', Back Sabbath's 'War Pigs' and Metallica's 'Fade To Black' to name a few) but as the trio has developed they have added more and more of their own compositions to their ever evolving set.